a group of people have formed around a smiling girl in a bright green t-shirt emblazoned with ‘Free City Tours’. I join the group and we set off on a meandering path around the city, an odd bunch of solo travellers like myself, families and a few honeymooners. And one strange Californian guy who keeps trying to tell me about his pet parrot. We throw some coins in the talking dog fountain by the QVB, which donates the money it receives to charities for deaf and blind children, and buy the most delicious and beautifully wrapped chocolates at Haigh’s. The QVB is as impressive inside as out, with Romanesque archways, mosaic tiled floors and the enormous stained glass dome in its centre, and is filled to the brim with expensive boutiques. We are taken through a secret passage which brings us out to the other side of the street where we find Angel Place. In this tiny, tucked away alleyway is an art installation called Forgotten Songs. 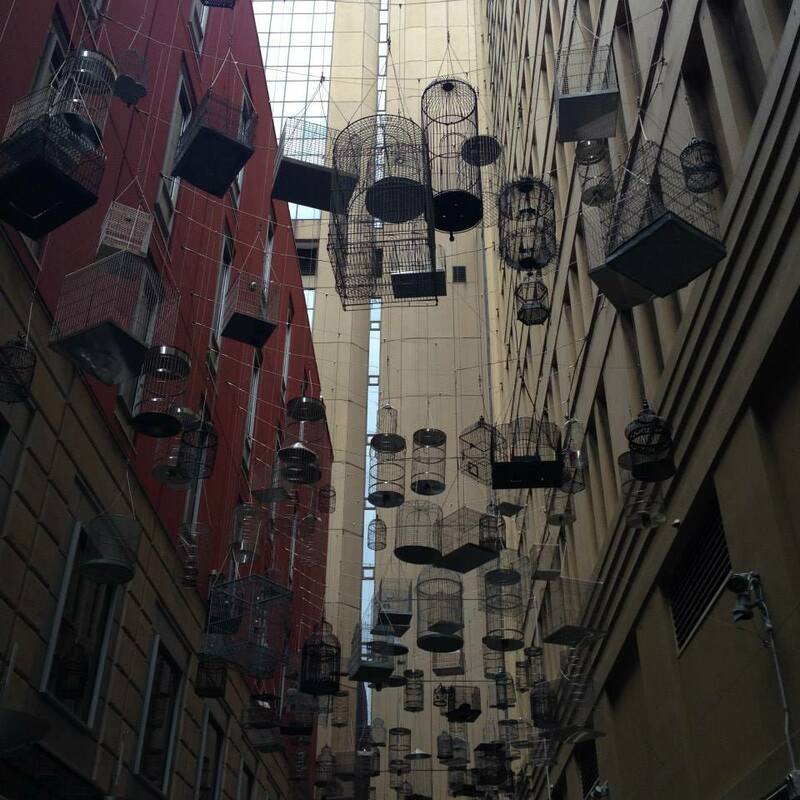 Hundreds of empty cages have been suspended in the narrow space between the buildings, each producing its own particular birdsong from a hidden source. It is quite eerie to hear birds singing, but not see them. Engraved on the ground beneath the cages are plaques with the names of the birds we can hear, birds that used to live here before Sydney became a huge, urban jungle. When night falls, the birdsong changes to that of nocturnal birds. It’s a thought-provoking piece of art, so tucked away that you’d be lucky to stumble across it. Unless of course you’re staggering in or out of the Ivy bar which happens to be just around the corner. Just next to Angel Place is Martin Place, business hub and setting for the famous fight by the fountain scene in the Matrix. Only a few months later the Lindt café here would be sieged by a crazed terrorist, the school I work at would go into lock-down because of a bomb threat and 2 people would be killed in an event that would shock the city. In the days that followed, Martin Place disappeared under a sea of flowers laid by people for people they had never met and yet felt connected to. Australia has always remained largely unaffected by terrorism and this was the last thing anyone expected to happen here. 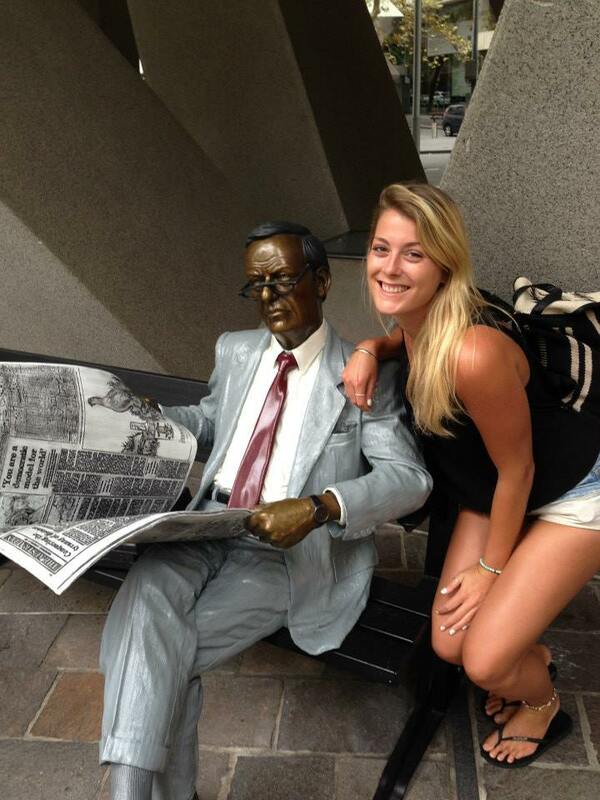 We take pictures next to the ‘Waiting Man’ statue by the Australia Square Building and ‘Il Porcellino’ in front of the old Sydney Rum Hospital. This is a replica of the wild boar statue in Florence and if you rub his snout it is meant to bring you good luck. Being constantly rubbed by tourists has turned his nose a golden colour. Interestingly, his nether regions are also gold…hmm. Our tour continues on and 3 hours later we are at the historic Rocks on a grassy patch next to the Harbour Bridge, looking across the water at the huge, shiny sails of the Opera House. I have seen this view before, on postcards and in brochures, but pictures don’t do this harbour justice. The view is breathtaking, this city is beautiful. I know already that 5 days here won’t be enough. There are two French guys in my dorm room. One has dark, curly hair and piercing green eyes. His voice is deep and gravelly and when he talks to me my insides turn to jelly. I drink too much goon and smoke too many cigarettes and find myself in bed with him, a sweaty tangle of limbs. And the next day, after a quick tour of Bondi in the rain. And again on my last night, after he manages to kick everyone out of his room. And then I have to leave. He had said he’d see me before I left, that he’d be up in time to say goodbye, the night before when I’d crept back to my own room, my skin still tingling from his touch, thoughts of anyone else wiped from my mind. I can’t even remember which room is his (classy girl) so I ask at reception. I hesitate before knocking and almost walk away when I hear movement from inside. But luckily it is him who opens the door, hair dark and dishevelled, still half asleep. We have an awkward goodbye in the corridor. ‘T’es trop mignon’ he says for the hundredth time in that gorgeous voice. ‘Well, bye’ I say and head for the stairs. As an afterthought he calls after me, ‘Facebook?’ We both know that we will talk to each-other sporadically, maybe like a few photos and then after a few months we’ll stop talking completely. I know this, but having that confirmed, virtual link to him makes it so much easier to leave and the knot in my stomach unclenches slightly. Then I’m on the plane home with a churning, empty feeling. An ‘adventure over’, back to reality feeling. I am amazed that one guy could have had this effect on me after just 3 days. It’s ridiculous. But of course, I realise, that’s the reason why in itself. The briefness and the impossibility of it. I always do this, even when I tell myself not to. Attach myself to unsuitable, unavailable men. And then I’ll pine for them for months, until the next one comes along. Love on the road. It never ends well. Never get attached to someone when you’re travelling, that’s the number one rule. Travel ‘relationships’, if you can call them that, are meant to be short and sweet and then you move on. See you later, have a nice life. But the very fact that you know this, that you tell yourself not to get attached, means you inadvertently hold on a bit tighter. Everything; every touch, every kiss, every word seems that much more intense and more important because you know that very soon both of you will be gone. So I fell in love with Sydney, and fell a little bit in love with a stranger. And I already know that I’ll be coming back to Australia. To Sydney? Probably. To him? Surely not. But to new experiences, new fleeting romances, and new adventures? Absolutely.